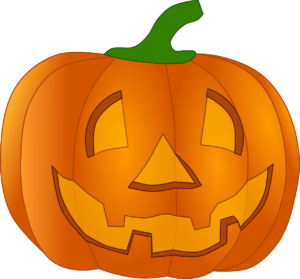 Halloween is almost synonymous with candy, and most people know that candy can cause cavities. What many people do not know is that some candy is worse and more likely to cause cavities than other types of candy. As dentists, it is easy to be a killjoy on Halloween. Since we know kids are going to load up on candy at Halloween, we are not going to tell you not to eat it. We’re going to give you information that will help you make better decisions about Halloween candy. The cavity risk associated with candy is based on two factors: 1) the amount of sugar in the candy, and 2) the amount of time the sugar from the candy is exposed to the teeth. 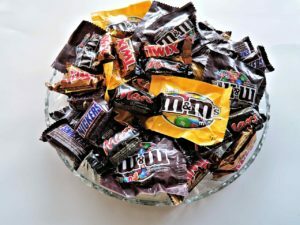 This blog will give you tips to help address both of these factors so that your risk of a Halloween cavity is minimal. In order to address the amount of sugar in Halloween candy, it is important to exercise moderation. Try not to binge on Halloween candy, and don’t let your kids do it, either. Eating large amounts of candy fuels the cavity-causing bacteria in our mouths with unlimited sugar. Limiting your candy intake to “dessert” (with a meal) also reduces cavity risk by counteracting the high amount of sugar with a high volume of healthy, cavity-fighting saliva. Sort through all your Halloween candy. Make three piles: 1) Sticky, gooey candy like caramels, Starburst, any kind of taffy, anything “gummy”. 2) Hard candies or anything that is held in the mouth for a long period of time like a jawbreaker or any kind of sucker (lollipop). Even mints fall into this category. 3) Chocolates or candy bars containing fat, anything that would be eaten quickly. Now throw away piles 1 and 2. These sticky and hard candies have a high risk for causing cavities because they expose the teeth to sugar for a long period of time. The sugar in sticky candies will adhere to the tooth, especially in deep grooves, and provide fuel for bacteria for as long as the candy is stuck to the tooth. You also fuel those bacteria by sucking on a piece of candy for an extended length of time. Eat your chocolates and candy bars in moderation as explained above. Feel Bad Throwing Candy Away? At Designer Smiles, we want to make Halloween as fun as possible while still encouraging good habits. Did you know there are programs that will actually buy all that Halloween candy back from you or your child? Follow this link to find places to take your Halloween candy. One great idea is to allow your child to use the money from the candy buy-back to buy a non-candy treat, like a Hot Wheels car or something from the dollar section at Target. Teach your children that making good choices for their teeth can also be fun!